Wild File Q&A: What causes the small brown and yellow patches on healthy plant leaves? 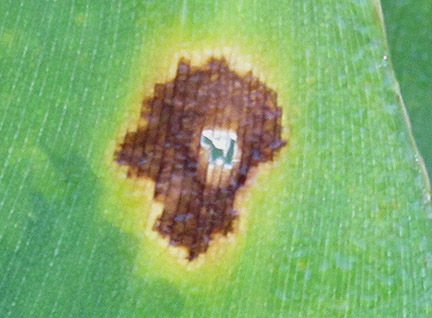 Q: What causes the small brown and yellow patches on healthy plant leaves? It’s often apoptosis, a term that comes from plant kingdom where the Greek apoptosis originally meant the loss of petals of leaves. Now, it can refer to both the plant and animal kingdoms and is also called Programmed Cell Death (PCD). Cells in plants and animals can self-destruct when they are no longer needed or if they are damaged. For plants, this achieves and maintains stability within the internal environment when it is dealing with external changes. Natural PCD (not caused by external factors) includes the timely death of petals after fertilization and the senescence of leaves. Host-controlled PCD is also a means of resistance to pathogens. Cells challenged by pathogens initiate a hypersensitive response, which is a rapid PCD process that is activated in order to inhibit the spread of invading pathogen. PCD in plants has a number of molecular similarities to animal apoptosis, but it also has differences. The most obvious is the lack of an immune system to remove the pieces of the dead cell. Greatly simplified, instead of an immune response, an enzyme is activated that destroys the central vacuole (a bubble-like cavity) in the plant cell, which is followed by disintegration of the rest of the cell. This creates a protective, dead “envelope” around the pathogen to limit its spread. This is what may appear on some leaves as a yellow and brown blotch. Some examples of apoptosis in the animal kingdom include the resorption of the tadpole tail at the time of its metamorphosis into a frog, the removal of tissue between fingers and toes of the fetus as it develops, the elimination of T cells that might otherwise mount an autoimmune attack on the body, and during the pupal stage of insects that undergo a complete metamorphosis, the death of most of the cells of the larva which provide nutrients for the development of the adult structures.